The Royal Institute of British Architects (RIBA) is pleased to announce Neave Brown will receive the 2018 Royal Gold Medal, the UK’s highest honour for architecture. Given in recognition of a lifetime’s work, the RIBA Gold Medal for Architecture is approved personally by Her Majesty The Queen and is given to a person or group of people who have had a significant influence ‘either directly or indirectly on the advancement of architecture’. Brown believes every home should have its own front door opening directly onto a network of routes and streets that make up a city, as well as its own private external space, open to the sky, in the form of a roof garden or terrace. Each of these qualities was incorporated by Brown at Alexandra Road. 22-32 Winscombe Street in Dartmouth Park, north London (1965), is a row of 5 terraced homes, designed as a private co-housing project for Brown and his friends. Winscombe Street was financially backed by the London Borough of Camden, as a prototype for the much larger public housing schemes Brown went on to design when he joined Camden Council’s architects department. 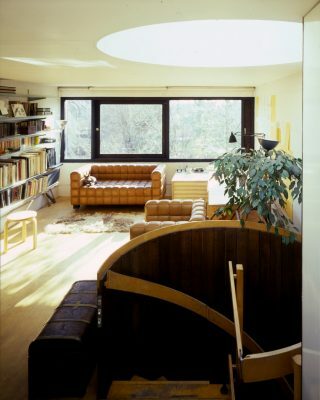 These hugely influential ‘upside-down’ houses placed the living space upstairs to maximise light, with self-contained, flexible rooms on the ground floor with direct access to private gardens. Brown lived in Winscombe Street for 40 years before moving to Fleet Road, another of his schemes. Dunboyne Road estate (Fleet Road), near Gospel Oak, north London (1975), consists of 71 maisonettes and flats, a shop and studio built for the London Borough of Camden. Fleet Road was the UK’s first high-density low-rise scheme; here Brown reinvented the traditional Victorian London terrace as two and three-storey blocks that run in parallel rows with a central pedestrian walkway. 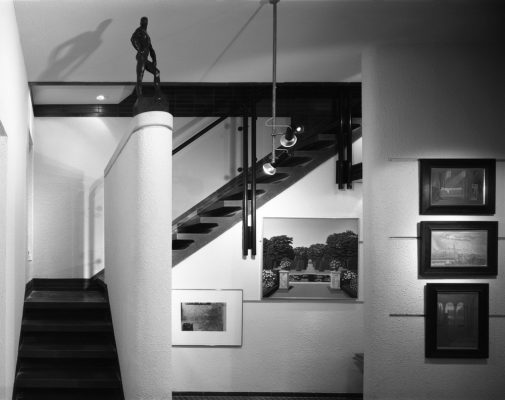 Care was taken to preserve its scale and intimacy, and to create light-filled homes, each with their own private terrace and a shared garden. “I’m delighted to announce Neave Brown will receive the 2018 Royal Gold Medal. 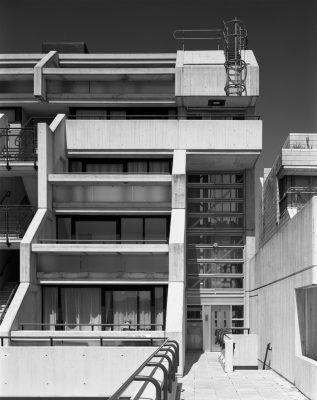 Neave’s contribution to the development of modern British housing is profound, inspiring to architects, local authorities and those who have benefitted from living in one of his outstanding projects. His pioneering ideas firmly placed the community at the heart of each of his developments, giving residents shared gardens, their own front door, innovative flexible living spaces and private outside space for every home. “At his Alexandra Road and Fleet Road’s estates, he showed how to achieve successful high density housing without high rise. The tallest part of the Alexandra Road is just 8 floors, dropping to 4 at its lowest point – yet 520 spacious and sought after homes were provided on this exemplar scheme. Neave Brown will be presented with the 2018 Royal Gold Medal at a private ceremony at the RIBA on Monday 2 October 2017. The 2018 Royal Gold Medal selection committee comprises RIBA President Ben Derbyshire (Chair), Edward Cullinan, former Royal Gold Medal recipient, Canny Ash architect, Sarah Wigglesworth architect and Lady Jill Ritblat, patron of the arts. The 2018 Royal Gold Medal medallist was nominated by Michael Swenarton, the architectural historian and teacher, Peter Barber, architect and lecturer and design tutor at the University of Westminster and the architect Edward Cullinan. 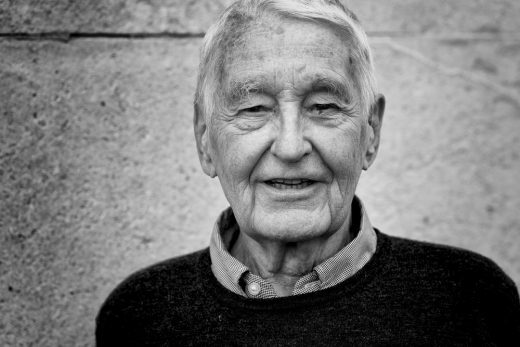 It is hard to think of anyone more fitting today to receive the RIBA Royal Gold Medal than Neave Brown. 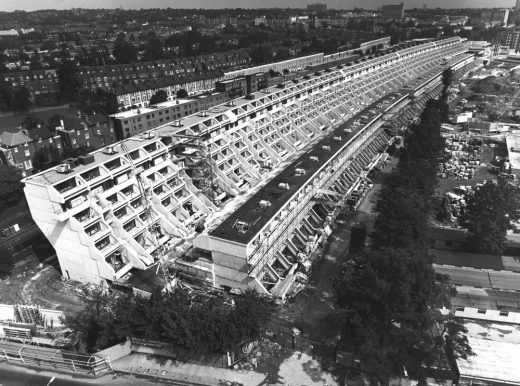 Between 1965 and 1979 Brown created three seminal works of increasing scale and complexity which together set out a new model for collective housing. First came a group of five houses for a housing co-operative in Winscombe Street. Next were two projects for Sydney Cook and the London Borough of Camden: Fleet Road (70 dwellings) and Alexandra Road, a multi-functional ‘piece of city’ comprising 520 dwellings as well as a park, shops, school etc. 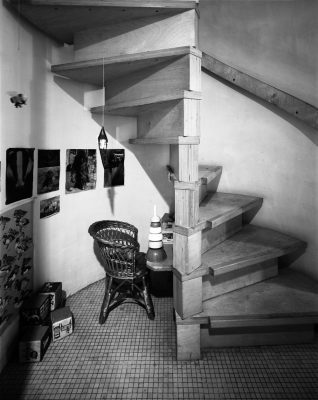 Against the orthodoxy of slabs set in empty space, stemming from the ‘death of the street’ proclaimed by Le Corbusier, Brown created a model in which connections were based on the street and the building fabric was continuous with the surrounding urban tissue. Not since Raymond Unwin (RIBA Royal Gold Medal 1937) in the early 1900s had a British architect offered so clear-cut and coherent an alternative to the prevailing orthodoxy in housing design. Here and in his final masterwork, the Medina at Eindhoven (2002), at the formal level Brown’s architecture is one of consummate skill. But for Brown form is not an end in itself but a means to a larger social and urban objective. Brown saw clearly that, in designing housing, the architect was above all designing the setting for social life and social relationships: between house and neighbourhood, one household and another, public and private, adults and children. And that in the act of making housing the architect was not simply ‘building in’ or ‘adding to’ the city, but actively re-making the city: strengthening its arteries – its streets – and thereby contributing to the health and wellbeing of urban society. Last year this 87 year old legend of UK Architecture set the RIBA Jarvis Hall ablaze with a scintillating presentation of his unique and extraordinary oeuvre. It was standing room only and the enraptured audience – students through to old buffers, the great and the good, residents of his buildings, acolytes all – hung on his every word. They lapped up the images of his projects – buildings and streets, terraces, roof gardens and public parks alive with greenery and coloUr…. a magnificent backdrop to people’s lives. Neave Brown’s status has grown and grown over the decades so that now, in his later years, he finds himself an ‘ in-demand’ (if rather unwilling) architectural celebrity. 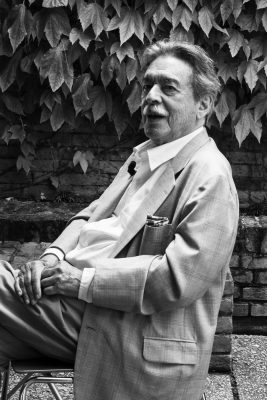 He has been inspiration to successive generations of architects and students of urbanism. 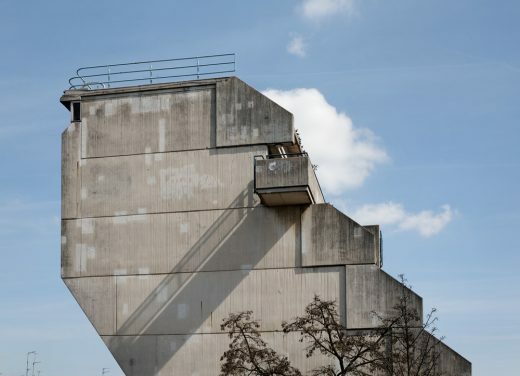 We can see the influence of his ideas and the imprint of his built work in much contemporary urbanism and architecture. Think of the section of BIG’s famous ‘Mountain’ in Copenhagen and compare it to Neave’s Medina urban quarter in Eindhoven. Think also of Neave’s lower-rise street-based approach to urban housing – unfashionable, derided even, in post war Europe but now pretty generally accepted and exemplified in projects across the world from Donnybrook Quarter to Borneo Sporenburg, by the likes of Atelier BowWow in Japan, Neutelings Riedijk in Holland and Aires Mateus in Portugal. 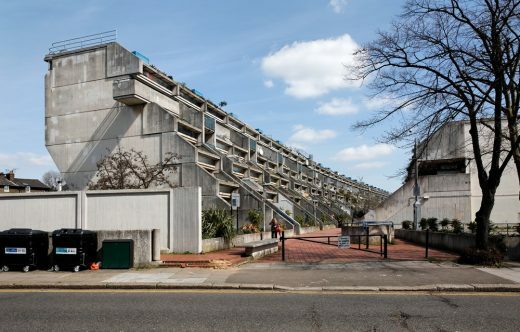 The award of the RIBA Royal Gold Medal is absolutely timely given the chaos and deep misery created by successive governments’ laissez faire attitude to housing and urbanism. It signals loud and clear the RIBA’s commitment to the social project of architecture, the redemptive capacity of buildings and our belief that the city is both a work of art and a powerful agent in the liberation of people and the improvement of their lives. Neave Brown has designed and supervised the building of four quite exceptional architectural compositions at Winscombe Street, Fleet Road, and Alexander Road in London, and Eindhoven in Holland. Winscombe Street is a row of five 3 storey terrace houses which look northwards down the street and southwards over a large garden shared by all the residents. 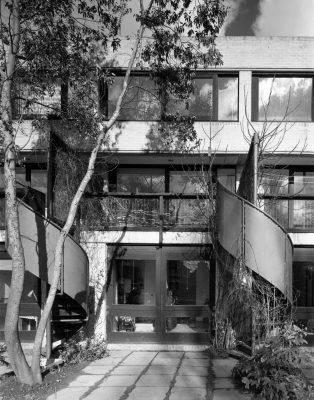 The scheme is elegantly devised from the work of Le Corbusier, but adds many subtle details and unique pieces to that origin, such as the very elegant concrete spiral stair which both unites and separates the three floors from one another and the private balconies which all have access to the shared garden. Well known architects and others who lived there remember with joy the unique combination of private and shared places. 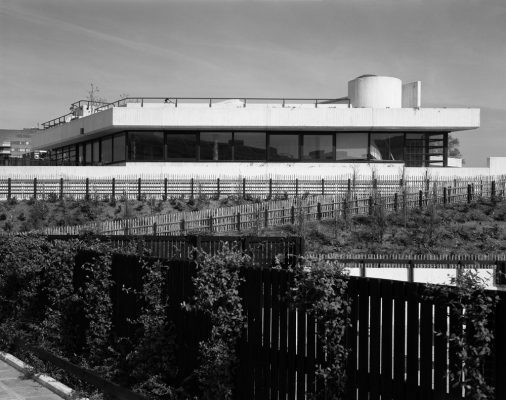 Fleet Road is the first scheme that Neave did while S.A.G Cook was chief architect for the London Borough of Camden. Here he has developed his thinking to produce an over ground mesh of 3 storey interlocking dwellings, access paths and roof gardens, covering an acre of North London; in some ways a kind of horizontal block of flats, a unique invention of his own. He now lives there himself with his wife Janet. 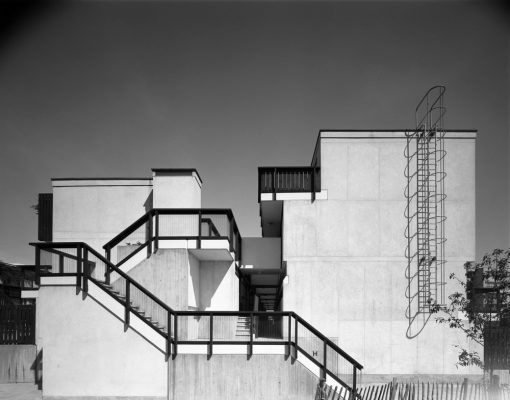 Alexander Road is the second great scheme that Neave Brown designed and supervised for Camden. Here we find a substantial further development of his own unique contribution to the design of local authority housing architecture. Along the North side of this large site is a busy, curving railway line, carrying express trains. Against this edge he builds highest, almost blank to the north, but stepping down floor by floor to the south, stepped balconies which end just above ground level in a lovely red brick path. To the south of the path houses and flats rise again, four floors, houses facing south over private gardens which open onto a public park whose south side is bounded by an existing block of flats. Many other buildings and uses are seamlessly included in this unique scheme. Eindhoven in Holland is smaller than Alexander Road but equally subtle. It interlocks car parking, flats and houses and roof gardens, stepping down to the south in a combination that derives from the previous three schemes but invents whole new combinations to suit the site and the functions it contains. These and other small buildings are what Neave Brown contributed to the happiness of the world, but he also introduced many other architects to the special world of Camden architecture, and he inspired them and learned from them in an incredibly positive way. He also taught and lectured on Architecture in a committed, clear and logical manner. 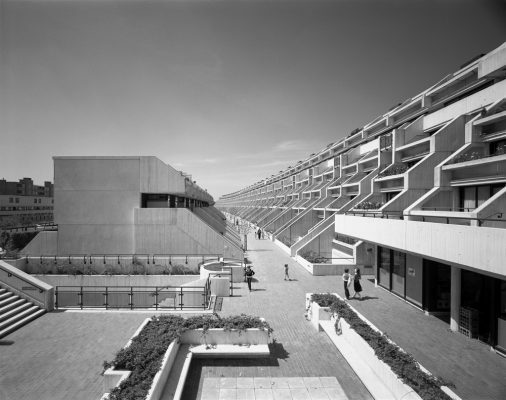 My name is Elizabeth Knowles and I have lived in Rowley Way since it was first built. I moved in when my son was one year old. 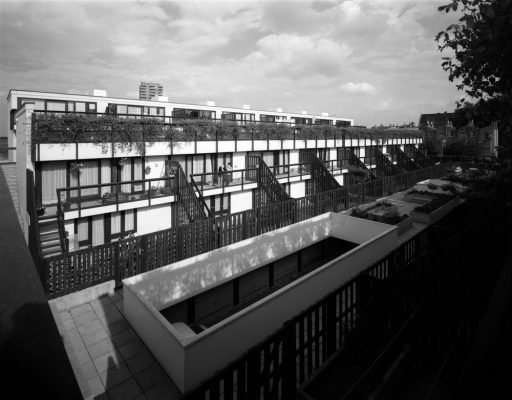 On behalf of the residents association, the friends of Alexandra Road Park and of every single occupant of Alexandra Road estate I would like to say MANY MANY CONGRATULATIONS to Neave Brown on winning the 2017 RIBA Gold medal. I am going to talk a little about Alexandra Road because this is the place I know. When we were lucky enough to be given a flat in Rowley Way in the 70’s, we already knew it was special despite the controversy surrounding it. The concrete was white and gleaming, and then, as now, our children played on the car free red brick road and in the park inbetween the buildings. For a while things were tightly managed by Camden, but then the estate fell into a period of despair. 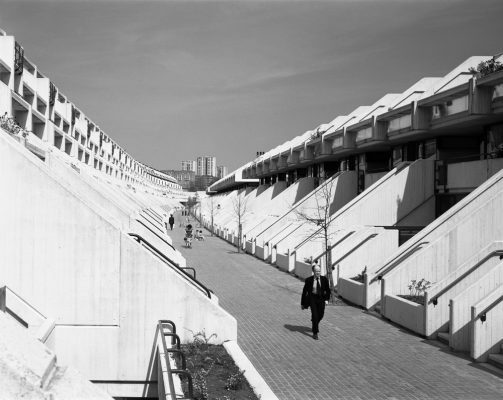 If you said you lived in Rowley Way at this time, you got a raised eyebrow or a look of sympathy. There were times when no-one would deliver to our flats and if you were a pizza delivery boy you were likely to be relieved of your pizza before it reached it’s destination – or so it was rumoured. Throughout this time, Neave Brown, shall we say ‘hung in there’ as did the residents, even creating a co-operative that managed the place for a 12 year duration. There were constant requests from students and academics of many disciplines, not only architecture, from all over the world asking for interviews with Neave Brown. These came to me via the secretary of the Tenants and Residents Association, Sara Bell, who has worked tirelessly to engage the Alexandra Road community. Neave Brown was unfailingly generous with his time, always seeing students when ever he could and over the years, always keeping in touch with us residents of Alexandra Road. I can honestly say that over 40 years Neave’s passion and generosity has never wavered. This summer, in the light of the nearby Grenfell Tower tragedy, we were reminded of how special our concrete village is. 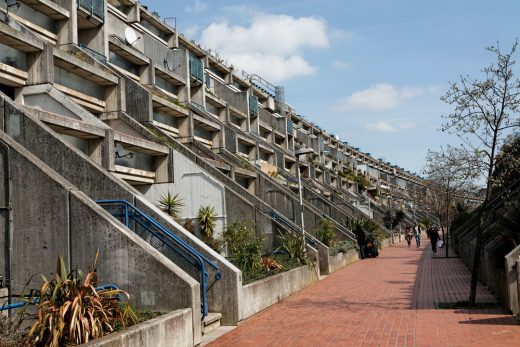 When Neave Brown was asked to build towers, he built low rise high density. All of our flats have good exits. What is more, the few fires that have occurred have been pretty much contained within the individual flat. When this summer I chatted to Neave about this, he murmured quietly, “yes we did think of that”. But it’s not all about buildings is it? This summer we had our annual residents fair in the park. It was decided that this year there would be a nominal charge of one pound for food. The residents association decided against this. You see we have perhaps nine or ten children on the estate who always turn up to these events well before time, and spend all day at them leaving late and these children would not have had their one pound. So the idea was dropped by mutual consent. Our neighbours are close, there are as they say no secrets on Rowley Way! So – thank you Neave Brown from the bottom of our hearts for our very special community and once again – CONGRATULATIONS.